A practice of GEI Consultants – a consulting engineering and environmental firm – the Oil & Gas team is led by renown scientists, thought leaders, strategists and data geeks. 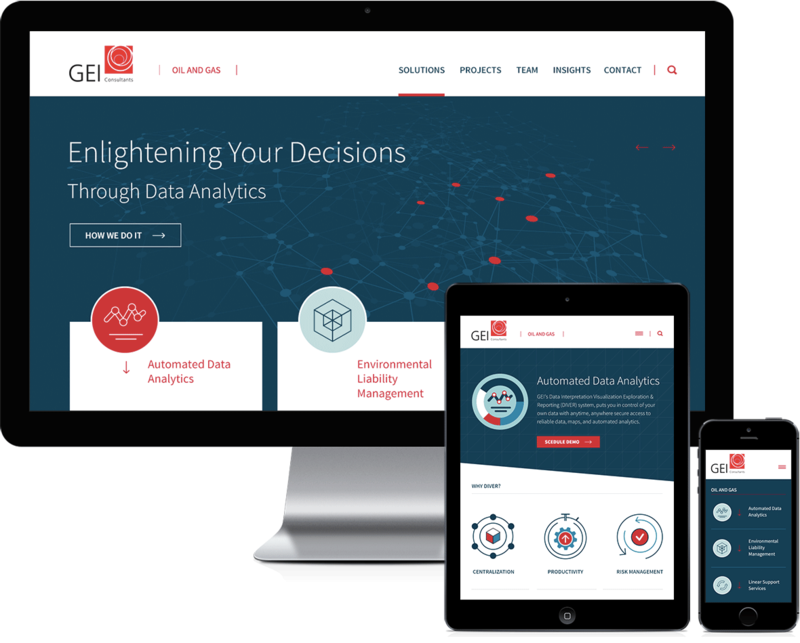 GEI needed a microsite that would help to strategically grow the Oil & Gas practice and position the firm as a ‘player’ in the O&G marketplace. The new website – from its structure and navigation to design and content – reinforces the key messages of strategic, research-led thinking and the team’s ability to solve the most complex, and even impossible, problems, while also bringing the team’s “quirky” personality to life. We took a very graphic approach to the site’s design – using diagrams and icons to communicate ideas and streamline information, fitting for communicating the scientific and data/analytics-driven approach and capabilities. Just like GEI’s O&G team helps clients make complex information understandable and usable, the visual diagrams help present GEI’s processes and offerings in a clear and concise manner. To ensure that the new website helps with lead generation and nurturing, we’ve placed clear, specific and contextually relevant calls to action in the key areas along the decision-making path. The site is built on the WordPress CMS with administrative workflow customized to GEI’s specific needs, enabling the GEI in-house marketing team to perform all content edits with ease and efficiency. Navigating your company through a website redesign is not an easy task, but it doesn’t have to be an ordeal. For more detailed information on the entire process from planning through post-launch, checklists and tips on avoiding common mistakes, download this e-guide. We had an excellent experience working with Substance151 on our new Oil & Gas microsite. They provided us with guidance every step of the way and were in constant communication throughout the entire process. Ida brought the right balance of creativity and functionality to the project and her organized approach helped us stick to a tight schedule and budget. We are very pleased with the outcome and would recommend Substance151 to anyone who wants to work with conscientious and knowledgeable professionals. Do you have a branding or marketing project in the works? We’d love the opportunity to share how our approach can help you fast-forwards results. To start a conversation, fill out our project inquiry form, call 410-732-8379 or email. Expert advice to help powerhouse your branding and marketing and stay ahead of your competition. Have a Question or Project? Let’s talk! To start a conversation, fill out our contact form, or you can call 410-732-8379 or email us.